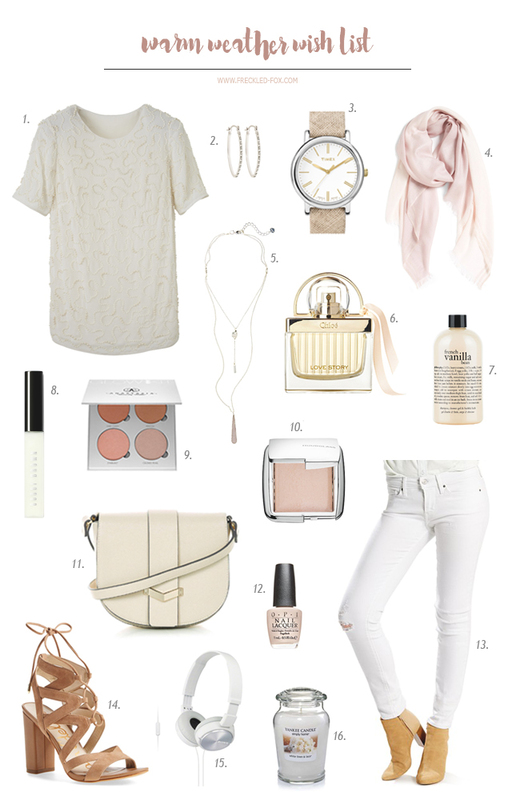 With the first day of Spring less than two weeks away and the warm sun shining outside my window right now, I've been having fun gathering Spring inspiration for the house, for makeup, for my wardrobe, etc. So here today I thought I'd share a little list of some favorite things I'd love to have in my closet or on my vanity right now to inspire you as well! If you could be given anything in this list what would it be? Thanks so much for visiting! I love those headphones, great list! It's the fresh stuff that I love decorating with...branches, buds, cold weather crops. An occasional bouquet and Easter lilies are my splurge. oh man I'm with you. I've had a big mix of faux and silk plants, but when fresh come into season I love having life in at least every main room if I can swing it. It really makes a difference doesn't it? Those lace-up sandals are drool-worthy! Love this list! I always try to bring Spring in from outside and pull in pastels instead of the typical Easter decor. Fresh Flowers, colored eggs (we color them early and may do several rounds) and new Spring-y candles are the best. I love your idea about the eggs! Thanks for sharing all of that! I'm obsessed with branches and blooms and the like this time of year too, especially after a long cold winter! THanks for your comment lovely!